Yep, a new design-- again. Hopefully this should be a little easier on the eyes-- the green got to me after a while. Still, feedback is always appreciated, so let me know if you have any problems/suggestions/etc. Who knows... maybe this one will stay up for a while (doubtful)! 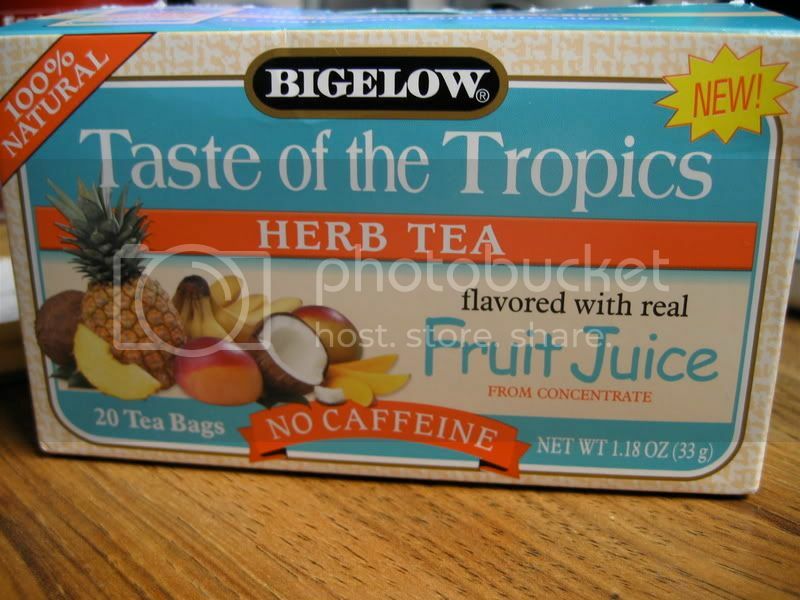 Bigelow's "Taste of the Tropics Herb Tea"
Year: The box says "NEW!" Let's start with the dry leaf bag. As is frequently the case with tea bags, it was filled with tiny particles, often called dust or fannings. However, this time I was completely unable to identify any of the particles. I know there is no camellia sinensis (true tea) in there, but beyond that your guess is as good as mine. Some particles were vaguely leaf-textured, some others were crystalline, and the rest looked oddly like bacon bits (I actually kind of wish they were). The best tasting part of the tea bag was the bag itself, in case you were wondering. Strangely, it smells kinda good. Against all my instincts, I went on and brewed a bag of this stuff. Surprisingly, I found myself with a nice-looking, colorful brew, and a renewed sense of hope. I leaned over to take in the pleasant aroma of tropical fruit... and almost vomited. I would probably call it sickly sweet and intense, but words cannot do justice to this odor-- it pierces your brain and leaves you virtually incapable of performing normal human functions for no less than 5 minutes. After I regained consciousness, I picked up the cup, trying not to breathe with my nose, and took a sip. It was unbelievably awful. 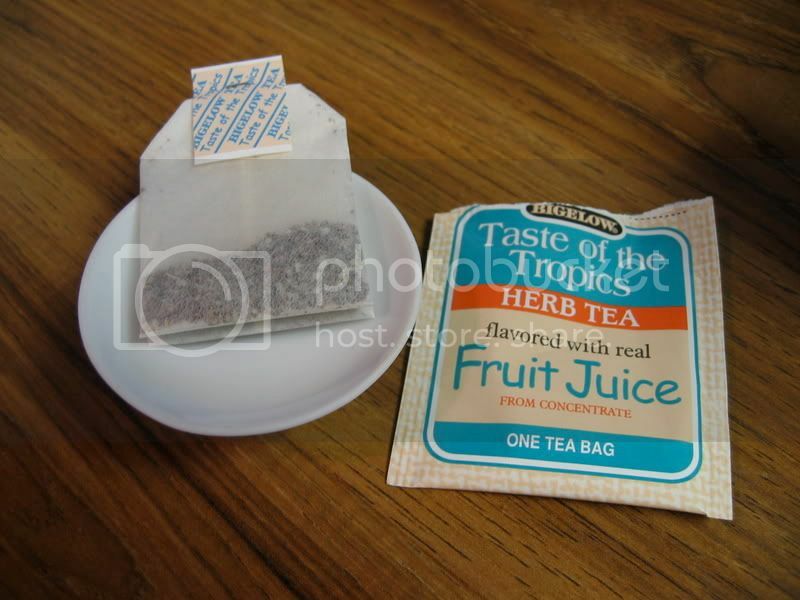 The brew's flavor began with a gentle citrus pucker, and quickly dissolved into an undiscernable hodgepodge of tropical fruit flavors and artificial sweetener. The strange thing is, the box claims that the contents are "100% natural." How on Earth they made something all natural taste worse than sweet n' low continues to perplex me. I think it should be fairly clear by now that this is not worth buying, or even accepting as a gift. The only thing that prevented me from making myself vomit was the realization that if I did, I would just have to taste this awful concoction again. Easily a 1/10. Also worth noting is that I have never felt more sickened after a review than I do now. Price: Not expensive, but I lost the receipt. Oops! Yes, that's right-- canned tea. I just saw it in the grocery store today and I had to try it. I've had a couple other bottled/canned tea concoctions before (think "it's brisk, baby"), but I haven't found anything I've really liked. I hear there are some good ones made by Japanese companies, but I have yet to try any of those. I'm not really an iced tea person anyway, so whatever. You've probably seen a Southern Tsunami franchise in a grocery store, but you may not have noticed it-- I know I didn't until I looked them up. Based out of California, they have "2551 sushi bars in supermarkets and other food service sectors throughout 45 U.S. states and Canada," according to their website. Their sushi isn't what you'd find at a decent Japanese restaurant, but it's still better tasting (and better for you) than that TV dinner and/or bucket of fried chicken you might otherwise pick up for an easy meal. I was pretty skeptical about this can o' tea at first (it is canned, after all), but I was pleasantly surprised when I saw "Ingredients: Water, Green Tea, Ascorbic Acid (Vitamin C)" on the side of the can. That's right, no sugar or oddball flavorings! So, I brought it home, took some pictures, poured myself a glass, and started writing this. Interestingly, it doesn't look artificial at all. Actually, it's sort of an ugly yellow-green, like bancha. So then I took my first sip, and the rest, as they say, is history. ...Just kidding. It's not really that spectacular, but then again it's not that bad either. It tastes a lot like bancha, so at least it's not some crummy Chinese tea sold in Japanese packaging to unwitting westerners. At first, it tastes just like water, but a moment later a refreshing bancha taste fills the mouth and lingers. Not bad at all! I'm excited that what they're selling as green tea actually tastes like green tea, as opposed to most of the other crap you'll find, and Japanese green tea no less. I was expecting some sort of low quality sencha or matcha when I bought the can, but frankly I'm glad it wasn't. Bancha is a refreshing tea anyway (even "brisk, baby", but in a good way), and I think if it were sencha I would expect more of an enjoyment beverage than a thirst-quencher. While I can't say I'll be ordering a case of this stuff-- let's face it, I'm not much of an iced tea guy-- It's really not that bad. 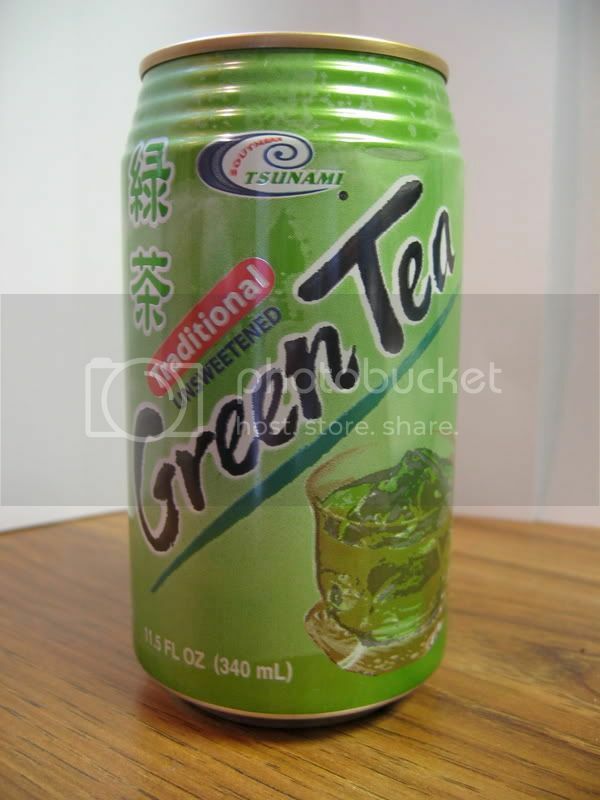 As refreshing in its honesty as it is in its taste, Southern Tsunami's canned green tea gets a 6.5/10. As my senses of smell and taste have still not fully returned (this head cold is really lingering), I thought I'd write another guide. 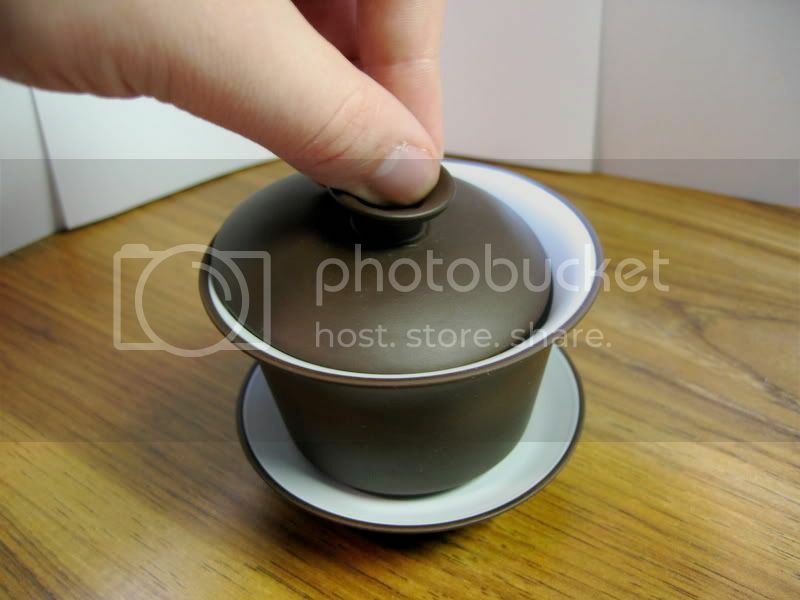 A gaiwan (or "guywan" with Wade-Giles romanization) is actually a pretty simple little contraption. 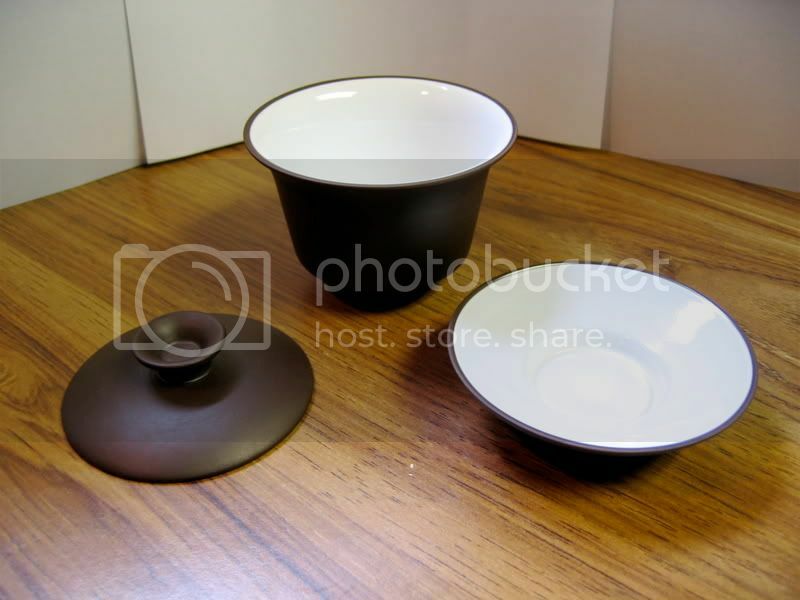 It consists of just three parts, as shown here: the lid (left), the cup (center), and the saucer (right). It can be made from pretty much anything except metal (which would absorb far too much heat), such as glass, porcelain, or clay. There are no bells and whistles here-- a gaiwan is essentially the same as any standard European teacup, except that it has a lid and no handle. Though the gaiwan can be used as a cup, it is more importantly used to brew the tea itself, replacing the teapot. One can, as I just mentioned, drink straight from the gaiwan, or one can decant the liquor into another cup or serving pitcher (not shown). Why should I use a gaiwan? 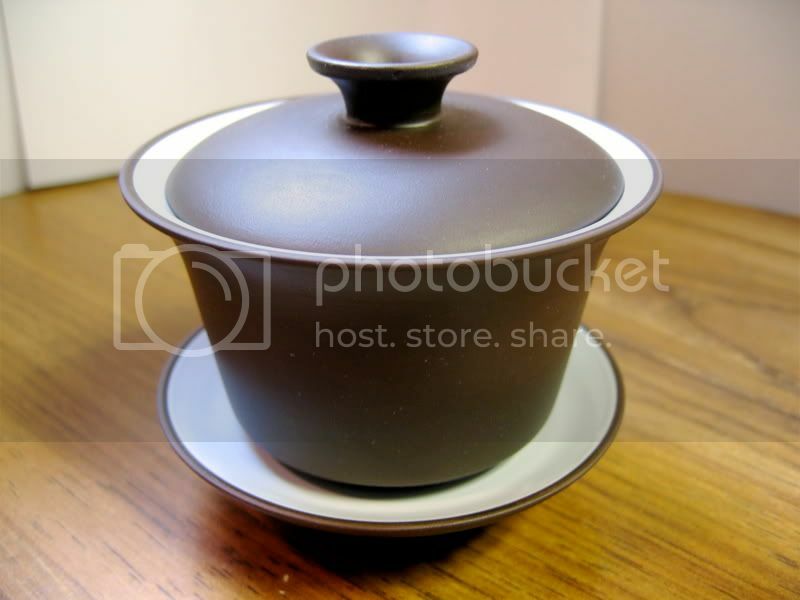 Most Americans have never seen or heard of a gaiwan. Here in the states, we are far more familiar with 10-cup teapots and 8+ oz coffee mugs, or other large scale tea preparation tools. 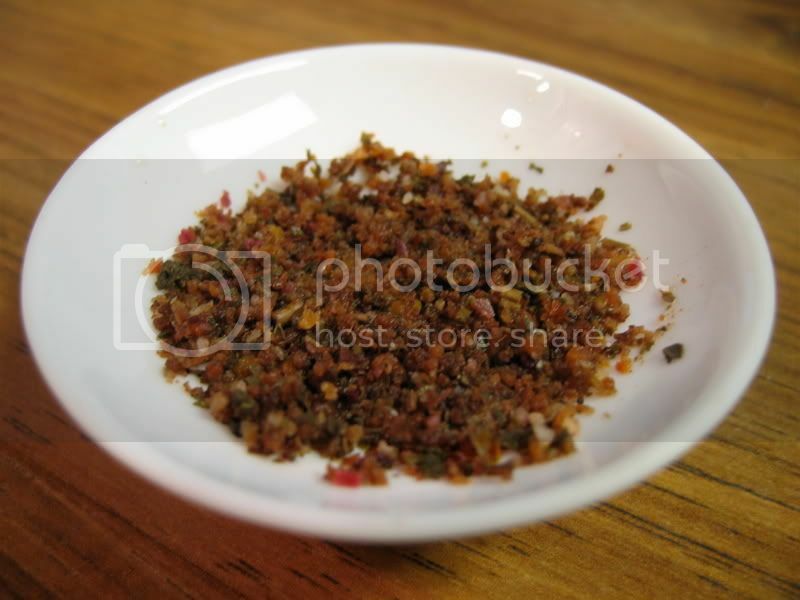 In contrast, the threshold volume at which a gaiwan is considered large is about 4 oz. In my opinion, tea is best enjoyed in small quantities, so the gaiwan is a perfect tool for making good tea. As any cook can tell you, recipes just don't turn out the same when preparing for twenty people versus only two. Subleties can be lost, and often the recipe will need major changes in its ingredients to bring out the right flavors. Unfortunately, when working with tea, the only ingredients we can change are leaves and water. We can't just add another teaspoon of a subtle fruity flavor or a pinch of citrus notes (well, we can with flavorings, but I'm talking about unflavored teas here) to make large quantities of tea taste right. This means that a tea's true flavors and aromas really only come out when it is made in small batches. The other great thing about gaiwans is that you can use them for basically anything. 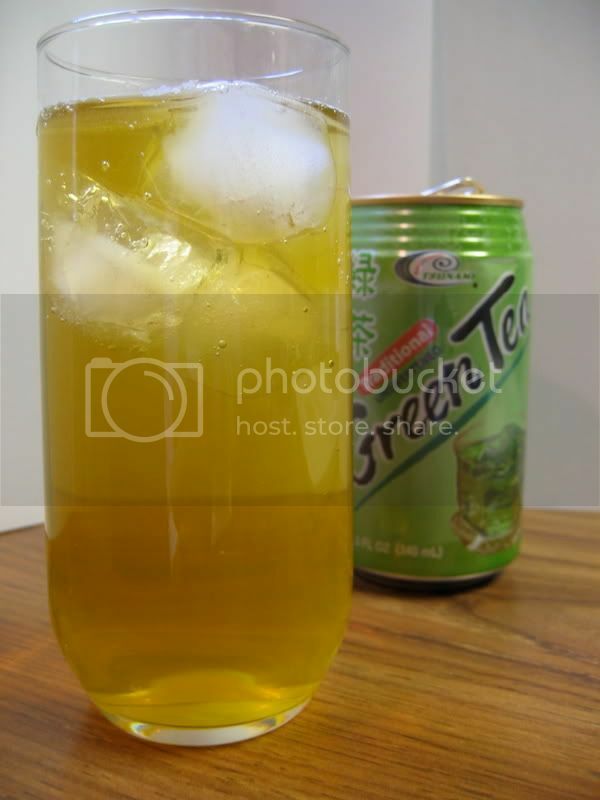 The only things that I see potential problems with are Japanese greens and rooibos-- these leaves are so small that it may be difficult to decant the liquid without letting quite a few of them through. Brewing black teas may also pose a problem, as it requires working with very hot water, but it can be done. How do I use a gaiwan? It was a bit daunting to use a gaiwan the first time I tried. To be honest, I'm still not quite sure I'm doing everything right. Nevertheless, I have put together a little guide (emphasis on little) for other beginners. Note that amount of leaf, water temperature, washing techniques, etc. will vary from tea to tea as well as person to person, so I won't even try to get into that here. For a good summary, check out Chinese Teas 101. When I started using a gaiwan, the hardest part was figuring out how to hold and pour the darn thing properly. 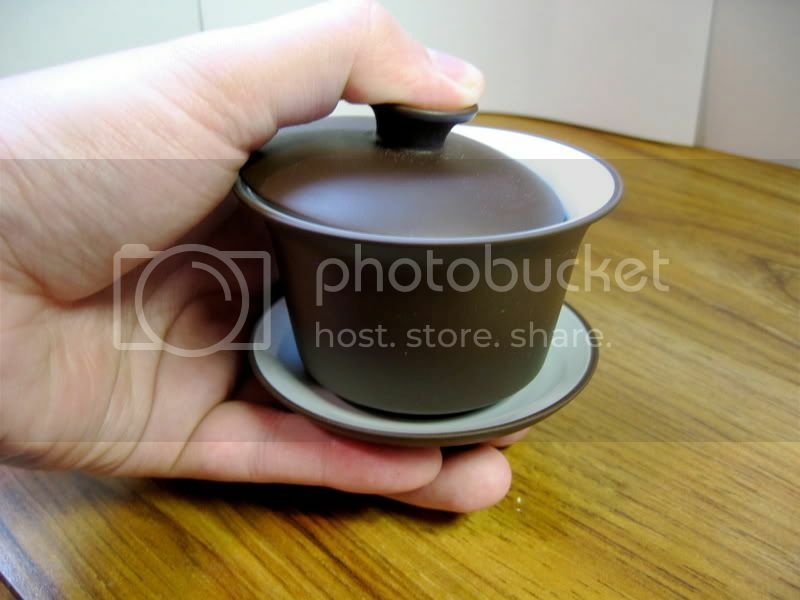 I read on some website (I can't remember where, sorry) that you were supposed to hold the gaiwan cup around its rim with your thumb and middle fingers, and then hold back the lid/tilt the apparatus with your middle finger. This led to some catastrophic failures-- tea all over the place, half of the leaves in my drinking cup, burnt fingers-- so I searched around some more. Taking strategies from both online sources (such as Chinese Teas 101's large gaiwan handling guide) and my own limited experience, I eventually found a fairly easy technique that also eliminated the risk of bodily injury/disfigurement. (Okay, disfigurement may be a bit over the top, but I couldn't resist.) So, without further ado, I give you my four step method to success. 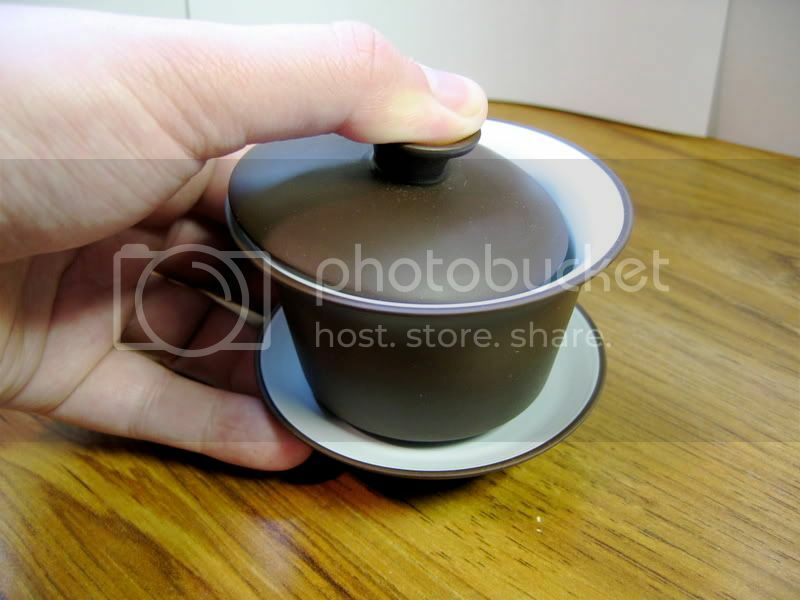 Step 1: Just before you wish to stop infusing, tilt the gaiwan lid. It should be tilted enough that liquid can quickly escape the cup, thus ending the infusion process precisely when you want, but it should not be opened enough to allow tea leaves to flow out with the liquid. Step 2: Carefully pick up the gaiwan. Placing your thumb in the dimple at the top of the lid, hold the lid tightly against the cup. Shimmy your fingers underneath the saucer (the saucer serves as insulation, preventing any chance of burnination). Step 3: Securely grasp the gaiwan. Apply pressure with your thumb and fingers, so that nothing moves. Step 4: Holding the three parts securely in place, turn over gaiwan to decant the liquor. 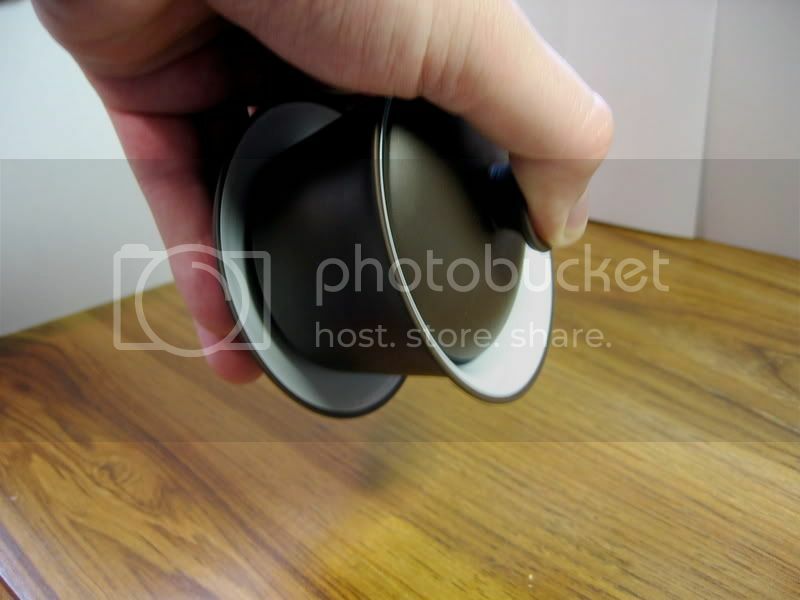 Though it is not shown in the photo, I would suggest pouring into a small pitcher or cup, rather than onto a desk. Many stores sell wooden or ceramic tea trays for you to do your gaiwan brewing on. While I could see how they would be convenient, I hardly consider this a necessity (I don't have one). Still, I would suggest staying far, far away from expensive electronics while you work out the kinks in your technique. Gaiwans are extremely versatile, and quite good at what they do. While they may not be as good as yixing pots for many Chinese teas, you do not need to worry about brewing vastly different types of tea with a glazed gaiwan. The best part? They're cheap, and they're all over the internet. The one shown in this article is from ebay, and was only $8.00! I actually paid more ($8.50) for the shipping from China than for the actual item. $16.50 is pretty hard to beat as far as teaware is concerned, and I'm sure there are even cheaper gaiwans out there. The only thing to be aware of is that glazes in cheap Chinese ceramics may contain lead, but a lead testing kit can be purchased quite inexpensively from your local hardware store. Now, go forth and brew! Before I begin, no, this is not the tea vendor we all love to hate that I alluded to earlier. I wrote a whole review of Teavana and it was pretty juicy, but I read over it and I sounded like a big jerk. So, instead, I've decided to do a real review (as opposed to a rant). Specialty: Large variety of teas. Focus on Darjeeling, Assam, and Ceylon. I have to say, Upton Tea Imports is one of the best vendors out there, especially if you are in the market for Indian/Sri Lankan teas. They carry a truly monstrous selection of teas from around the world, they package and ship their products very carefully, and they provide prompt customer service. I simply cannot overemphasize the number of teas they stock-- it is truly mind boggling. As of March 15, 2007, I counted 250 black teas, including 59 Assams and 67 Darjeelings; 98 green teas, 32 oolongs, 18 whites, 9 pu-erhs, and 124 other teas filed under "miscellaneous." 19 of these are sampler sets, so that totals to a whopping 512 individual teas, 103 of which are organic. Even better is the fact that you can purchase a sample-sized packet (around 15 grams) of any of these. 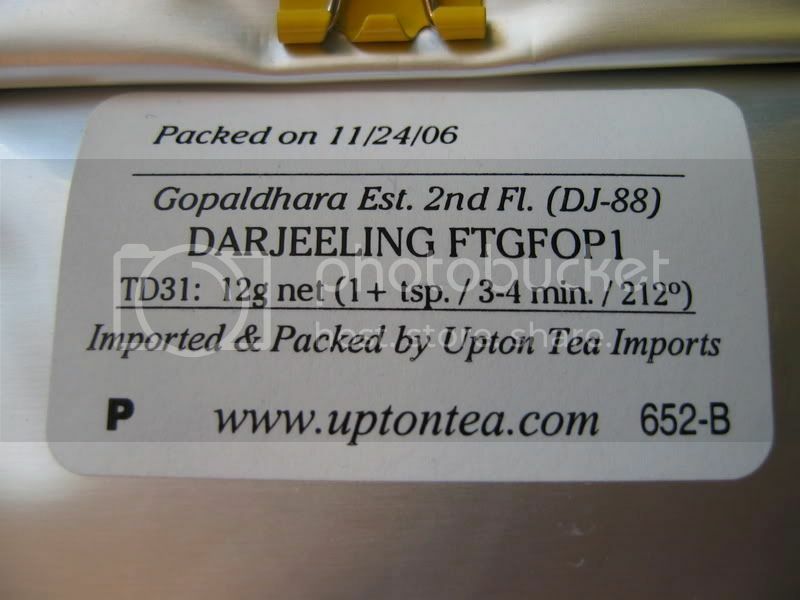 Though I mostly order Darjeelings from them, I have tried a few of their teas from other regions. I wasn't all that impressed with their Japanese teas (gyokuro, fukamushi sencha, and kabusecha) but I can't say they were bad, just not that great. I also receieved a free sample of their "fancy oolong," which I didn't really enjoy. Despite these shortcomings, a number of their Darjeelings have been nothing less than stunning. They have a great selection of single estate DJ's, so there is almost always something different for me to try. I haven't had a chance to try their Assams or Ceylons, but I assume they are just as spectacular. Another reason I like Upton is that they pack their teas well. You usually have a choice of purchasing a packet or a tin, depending on the amount you are ordering. 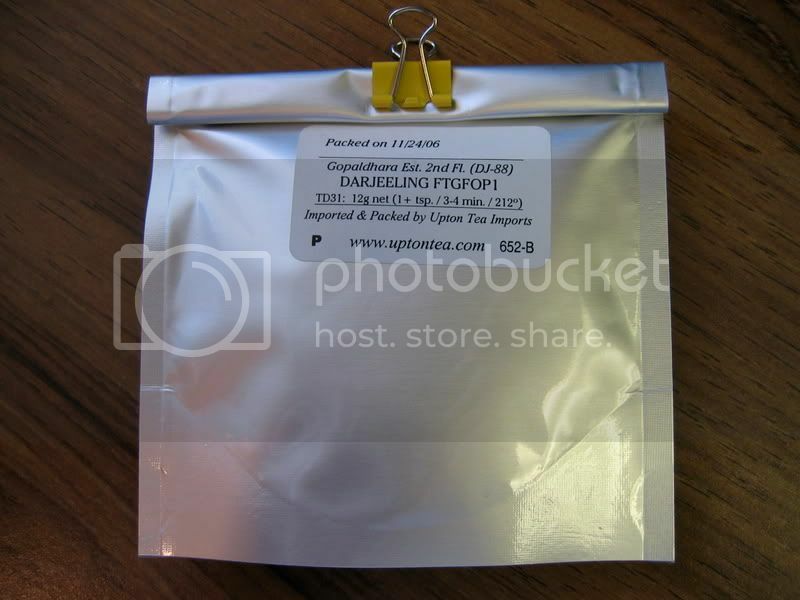 Their tins (plug-top style) and packets are well sealed (though the sample packets aren't resealable) and keep out light. They also print the packing date on their containers, which is pretty nice. Unfortunately, their web site is pretty ugly. It's functional, but still ugly. They have a lot of nice information on there, but they could probably reorganize it a bit like Adagio Teas, which has a really nice site. Don't get me wrong, I think it's great that they put their product first and their image second *cough*teavana*cough* (sorry, couldn't help it), but they might get even more business if they made their site more user friendly. The icing on the metaphorical cake is their great customer service. They are prompt, thorough, and courteous. Though I haven't had the opportunity to call them for advice, I have heard from others that they are very knowledgable and more than happy to assist you in selecting teas that you might enjoy. One more great thing about Upton is their newsletter/catalog. If you wish, they will send you a catalog (or include it in your order) that has a very nicely written article (updated each issue) on the history or current events of the tea world. You can also find these articles online, but I've always liked reading hard copies more than web pages. 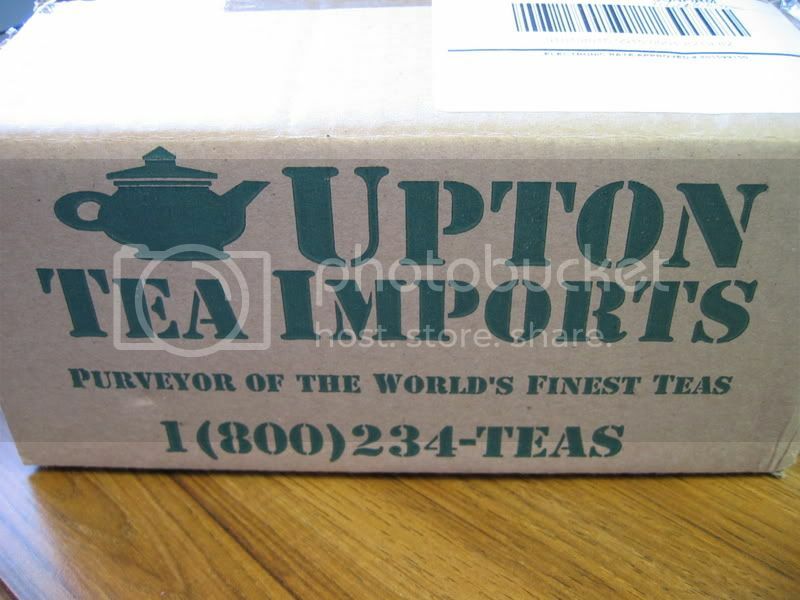 In conclusion, Upton Tea Imports is an excellent vendor, and one of my favorites. Though their website isn't much to look at, this is easy to forgive. 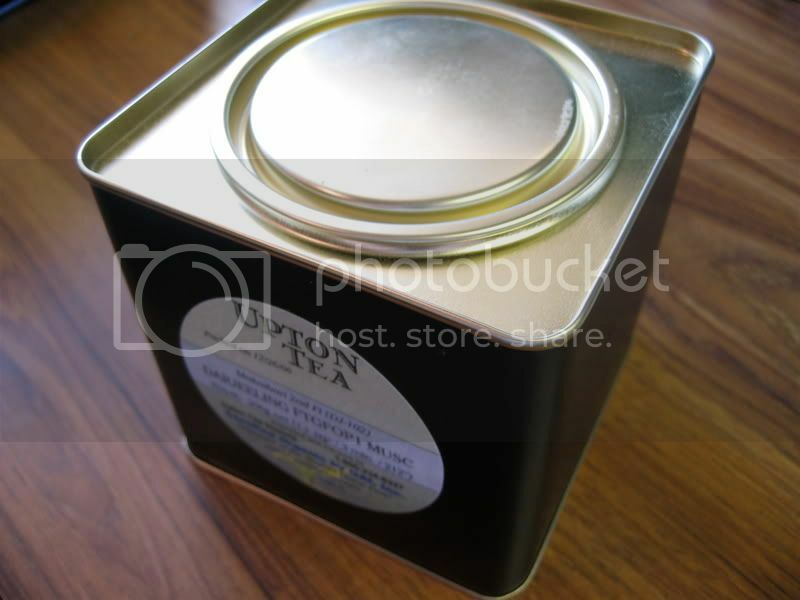 Due to their great selection of teas, especially from the subcontinent, and their dedication to excellence in quality and service, Upton Tea Imports earns the rank of ÜberVendor. I just wanted to let you know that I haven't given up yet, and that I plan to resume posting ASAP. I've either been busy, sick with a head cold, or lazy (or any combination of the three) for the past couple weeks, and it doesn't look like this week is going to be any better. I have a pretty juicy post in the works about a certain tea vendor we all love to hate, so get ready. Thanks again to all my readers for putting up with my long stretches of inactivity-- as my hero Alton Brown likes to say, your patience will be rewarded.